The Huh? : Metal Gear Legacy Site: Snakes in a Game! 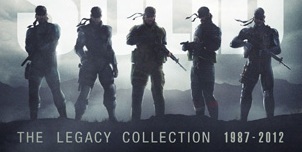 It appears as if the Japanese site for the Metal Gear Legacy Collection has been opened- http://www.konami.jp/mgs_tlc/ - and it looks good. There's a big timeline of the series, and tons of info I cannot read. (Update: A page translation worked pretty well, I used Bing and it did a decent job) This site is great even if it's just for seeing how the MG series has evolved over the years.